The Wake Tech ESL Blogs are a wonderful resource for you and your students. 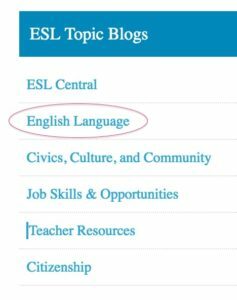 The Blogs contain links to help students improve their English and navigate everyday life in the U.S. Please help us “spread the word” to the students and our other teachers! A series of blog posts (called the “Blog Blast”) will tell you all about the ESL Blogs. 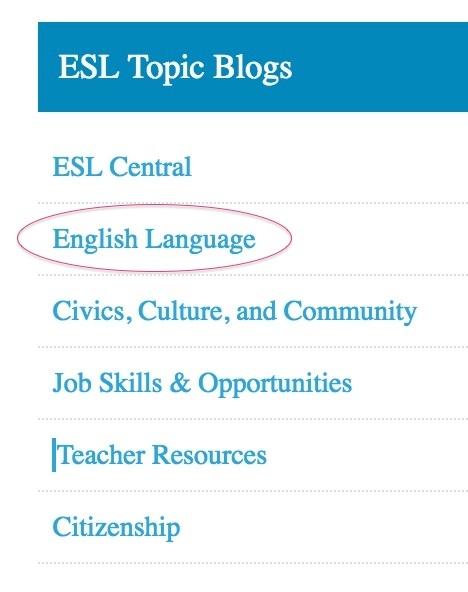 Each post will focus on ONE category (ex: Class/Textbook Resources) of one of our ESL Blogs. Since each of our categories has many links, only the most popular links will be shown for that category. Underneath those, you will see links to additional blog “pages”. If it is a link to a separate blog page, it will start with 3 dots “….” Click on these to see other related links and websites. In this first set of Blog Blast posts, we’ll describe the English Language Blog. 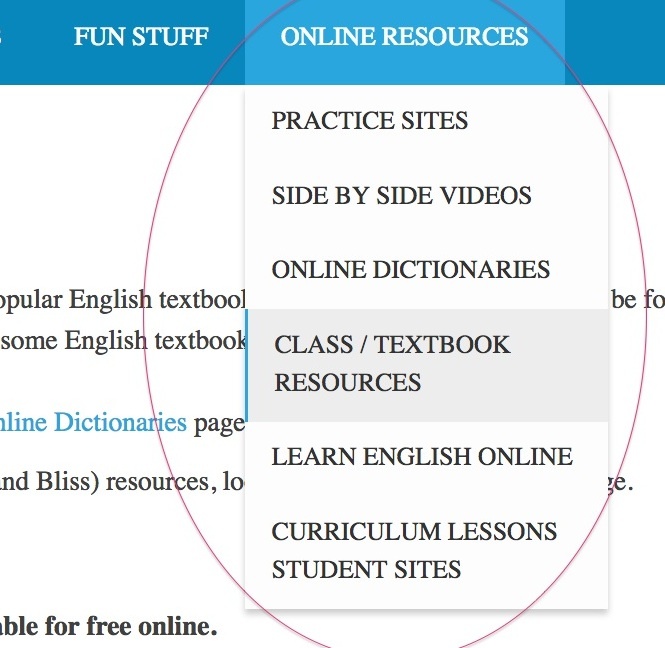 Our first category is Class/Textbook Resources, right under the ESL Topic Blogs group. 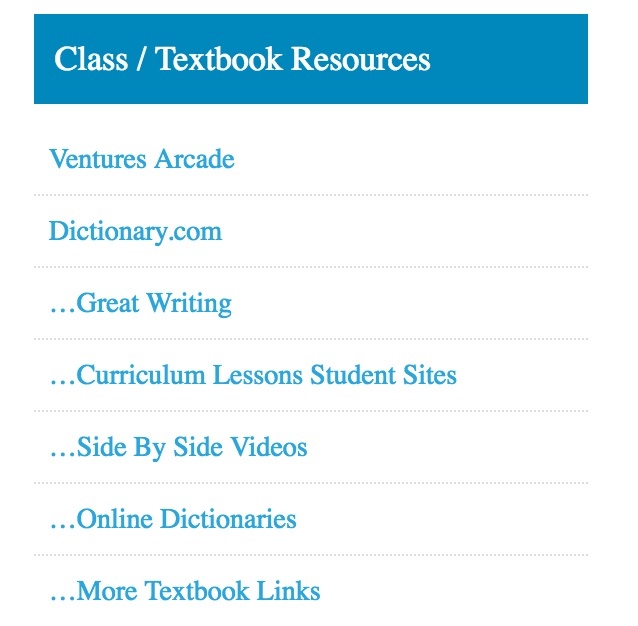 The Class/Textbook Resources category contains web links to complete ESL student textbooks, online resources/activities from specific textbooks, and key ESL reference books (like dictionaries). Ventures Arcade link brings you directly to the publisher site where you can choose activities based on textbook level and unit. The Great Writing page links you to activities for Keith Folse’s series of books. The Side by Side Videos can be used with or without the books. They visually go over specific grammar points in an entertaining way. Students love them. The Curriculum Lesson Student Sites page can be used to easily access student activities / websites referenced in our Wake Tech Curriculum Lesson Plans. The Dictionary.com link is a fast, easy way to link to a great dictionary but the Online Dictionaries page has several links (many suggested by teachers in one of our convocations). Lastly, the More Textbook Links can be useful to you to supplement activities from GrammarLinks books and other text books. Please check out the COMPLETE textbook PDF’s in the bottom section. You may be able to make great handouts from some of these. Some students also want to buy a good textbook and these can save them money and help them study English at home. The right hand column is the best way to reach the category and links described above. However screen size is limited on some mobile devices (especially phones) and the right column links are often shown WAY below the blog posts where students can’t find them. We’ve placed a similar set of links for the category on the top menu bar that can be reached via this icon on phones. If you have any suggestion to add to this link category, feel free to add them via a comment to this post. Thanks and welcome to the ESL Blog Blasts!